Does your Pool have a Bird or Duck Problem? 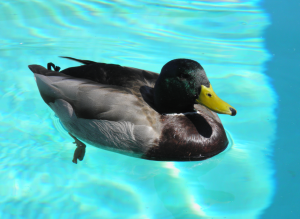 We’ve had a lot of enquiries lately from schools, retirement villages and private owners experiencing problems with ducks making their pool – their pond. Every morning starting the day by cleaning up duck feathers and faeces in a pool only to do it all over again is enough to drive a person mad (or so our clients tells us…!!). We’ve come up with a natty solution that involves building a structure around the pool then covering the structure with netting. Al’s background in commercial building and having a BSA license has certainly come in handy in constructing this solution – something that is unique to Bird Proofing Australia. This is once again, a permanent solution to dealing with your bird problems. It also minimises leaves and other debris falling into the pool. If you’d like to know more about bird proofing your pool, the best bet is to contact us on 1300 136 125 and discuss your specific issues with us direct. We are more than happy to help, and if we can’t, offer solutions that can help you.